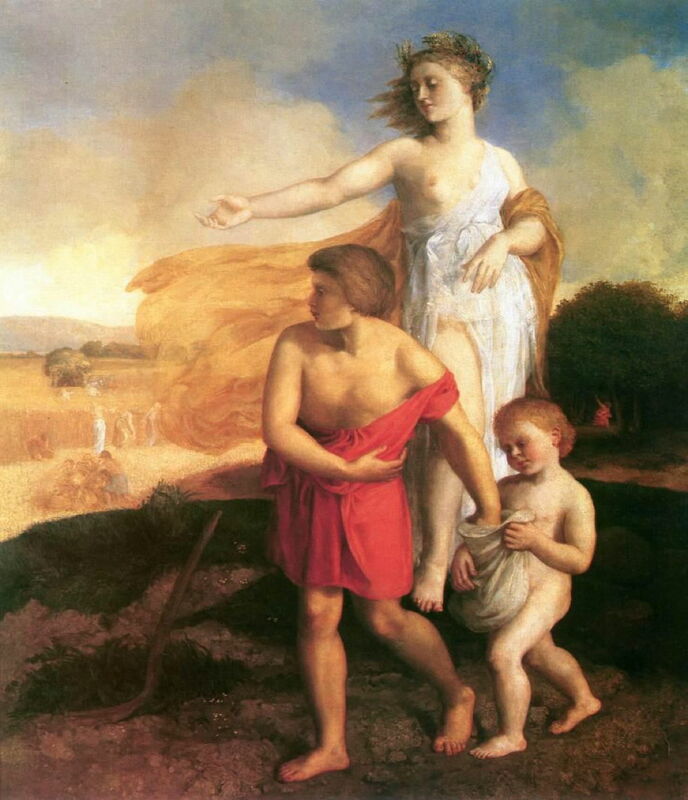 Károly Brocky (1807–1855), Ceres and Triptolemos (c 1853), oil on canvas, 139 x 119 cm, Ottó Herman Museum, Miskolc, Hungary. Wikimedia Commons. As Ovid reaches the end of book 5 of his Metamorphoses, there is time for one last story, narrated indirectly by the Muse Calliope. With Arethusa transformed into an underground river, Ceres harnesses a pair of dragons to her chariot, and travels to visit Triptolemus. She gives him seed, which he is to sow in unproductive land, which has never been cultivated or has long lain fallow. The young Triptolemus flies away in her chariot, and eventually comes to Scythia, where he enters the palace of its king, Lyncus. As far as I can tell, there have been very few paintings made of Lyncus trying to kill Triptolemus, or of the king being transformed into a lynx. The one which I have been able to trace is sadly not available as an image for use here. Triptolemus was an important deity, though, as an assistant to Ceres in bringing productive grain crops to Europe, and for his involvement in the secret rites of the Eleusinian Mysteries. I have chosen three images which show Triptolemus in his role of providing seed to produce nourishing crops. “Aberdeen Painter”, Triptolemus and Korē (c 470-460 BCE), tondo of a red-figure Attic cup discovered at Vulci, 36 cm diameter, Musée du Louvre, Paris. Image by Jastrow, via Wikimedia Commons. 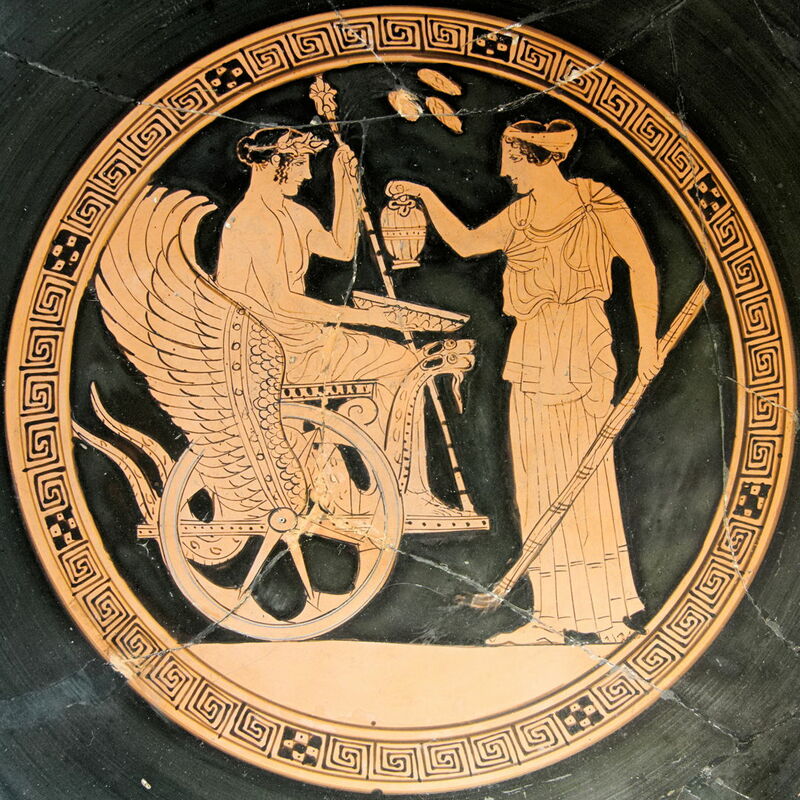 This tondo of a red-figure Attic cup, now in the Louvre, is typical of many classical depictions of Triptolemus and Ceres, and dates from 470-460 BCE. The young deity is sat in Ceres’ special winged chariot, as she provides him with seed to be distributed to the lands around the world. Jerzy Siemiginowski-Eleuter (1660–1711), Allegory of Summer (1684—86), oil on canvas, 550 × 435 cm, Muzeum Pałacu Króla Jana III w Wilanowie, Warsaw, Poland. Wikimedia Commons. 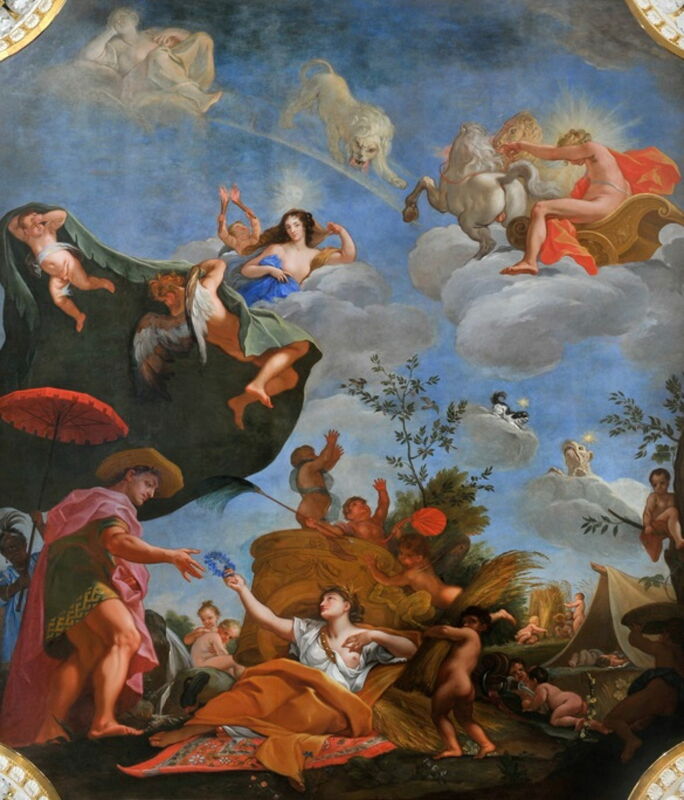 Triptolemus also assumes the same role in the left foreground of Jerzy Siemiginowski-Eleuter’s splendid Allegory of Summer (1684—86), made as a ceiling painting for the bedroom of King John III Sobieski of Poland. Ceres herself is in the centre foreground, handing an unusual blue floral wreath to Triptolemus. Above him is an allegory of the night, with the figure of Aurora-Astraea, who was modelled by Queen Marysieńka (Marie Casimire Louise de la Grange d’Arquien), wife of King John III Sobieski of Poland (1629-1696). Low in the sky is the ‘dog star’, which is generally visible across Europe in the summer. Above is the chariot of the sun, which is in the constellation of the lion, Leo. These symbols of summer are coupled with the more obvious signs of harvest, to complete the elaborate seasonal allegory. Károly Brocky’s Ceres and Triptolemos (c 1853) is a later and simpler evocation of these gods and their roles in productive agriculture, which uses a quiet form of multiplex narrative. In the foreground, Ceres is bidding the young Triptolemus to sow seed from the bag carried by a young child. However, in the background the harvest is also in full swing, many months after that seed would have been sown. I regret not having any lynxes to show, but love Siemiginowski-Eleuter’s intricate allegory. Posted in General, Language, Life, Painting and tagged Brocky, Ceres, Metamorphoses, myth, narrative, Ovid, painting, Siemiginowski, Triptolemus. Bookmark the permalink.